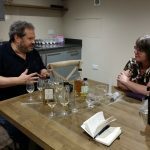 What surprised me the most was that the majority chose the answer “surprise me” – showing no clear preference in the type of whisky they wanted to see reviewed. Those who did choose one of the three types of whisky showed a clear preference for “Show me the daily drams”. 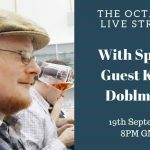 People want to hear about great value for money whisky. 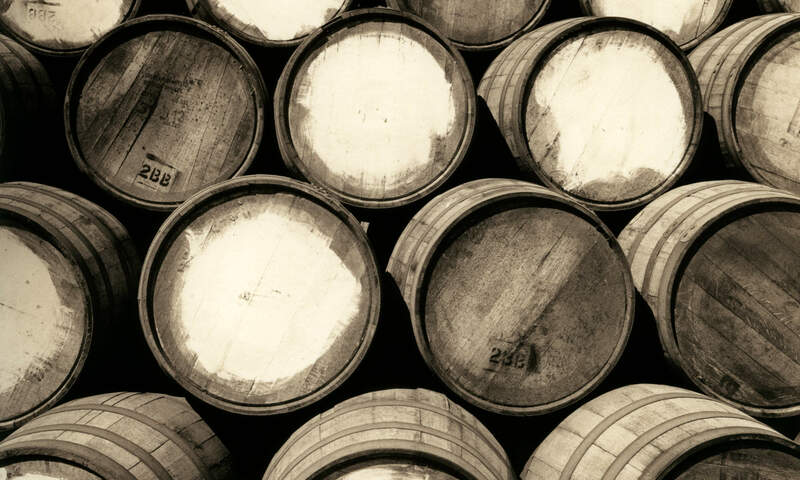 In a world of ever-increasing whisky prices, people seek guidance. Do they want to hear about the latest four-figure posh crystal decanter whisky? Yes, they do, but they care much more about drams actually suiting their whisky budget. A case in point is my review of the 12 yo Kilkerran – very good, very affordable and one of the whisky reviews with the highest number of clicks this year so far. A number of people chose wanting to read about “the hottest new thing”. This is not unsurprising – people expect guidance whether new releases are actually worth their hard-earned cash. “Old/rare” whisky was the least chosen option – probably because they rarely are “daily drams” for most of my readers (as well as myself). They’re still interesting to read about, but not as relevant. 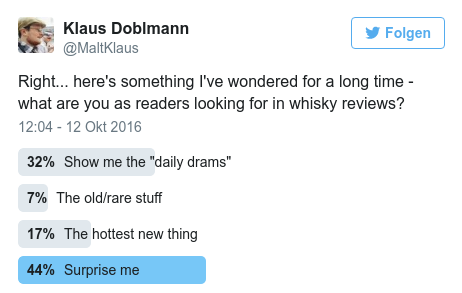 Going forward this means several things for me: The title of my blog is “MaltKlaus’ daily drams” – and daily drams is the category most people want to read about. I see this as a clear indication to try and focus more on that particular group of whisky. This suits my personal quest to find great value for money daily drams for my personal consumption – and the vast majority of my drinking stock is made up of good, affordable “daily drams”. I will continue to review as many of them as I can! The “hottest new thing” category proves to be a bit challenging. I obviously cannot buy enough bottles to publish 1-2 reviews a week, that’s impossible. 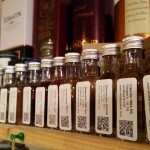 Lacking a whisky store, let alone a whisky bar in my area, it’s also hard to just head out and try new things, I rely mostly on samples, either bought myself, swapped or sent to me by whisky companies. I do not beg for samples, I am not into whisky blogging to get free samples, thus I depend on the goodwill of the industry to ask me whether they can send me samples (and, to my delight, this is happening more frequently these days). If there are no strings attached, I gladly accept and review those in a timely fashion. And then there are all the bottles in between. Older whisky, rarer whisky, more expensive whisky, whisky bottled some time ago. I will keep reviewing them as I open them or buy/swap/get samples. 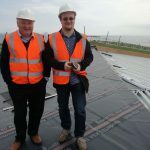 These do not necessarily get the most views, but they can be very educational and insightful, both to myself and my readers. And, besides, the majority wishes to be surprised anyway, without a clear preference. What do you think? Which category is the most relevant and/or insightful to you? Let me know in the comments section below!